Glass House #1613 is a beautiful two bedroom home in Denver’s best building. Located on the Northwest corner, this home has incredible views of Commons Park and the Rocky Mountains. This efficient floor plan is easy to lay out and has captivating views from every room. The bedrooms are separated by a dining and living room. The kitchen features cherry cabinetry, stainless steel appliances and slab granite counters. 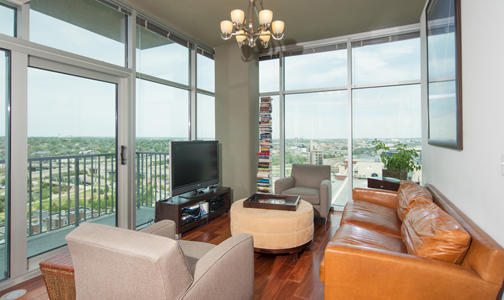 Mahogany hardwood floors throughout the entire condo are in pristine condition. The master suite has a walk-in closet and private bath. The home is flooded with natural light as it’s situated on a corner. The guest bath has dual access from the living area and the second bedroom, perfect for guests. This home has it all. Glass House is a full amenity building featuring a swimming pool, gas grills and fire pit on the 8th floor. Inside includes the club room with a movie theatre, catering kitchen and a few lounging areas. At the base of the building is Riverfront Athletic Club. This is a full fitness center with six personal trainers, a variety of group classes, cardio equipment, weigh room and locker rooms. All of this plus a 24 hour front desk staff and the incredible location of Riverfront Park.